Most hunters have hunted during unseasonably warm weather at some time in their hunting careers, but many hunters out west are very familiar with hunting in hot weather. Hunting in the heat is a very unique circumstance and it requires some preparation and knowledge. In parts of California, Utah and Oregon, early season hunts can occur during 100 degree weather. 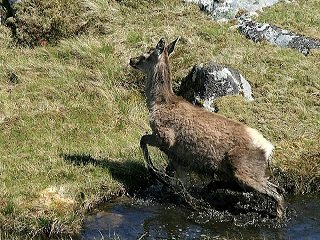 The first obstacle of such heat is that deer movement is minimal during such temperatures. This is why water sources and large shady areas are essential starting places when it comes to scouting and hunting. Other good places that are cooler include creek bottoms and north facing slopes. The north facing slopes barely receive direct sunlight and offer some permanent refuge. Some other draw backs of hunting in the heat in areas that contain extreme terrain, include hunters having to climb to higher elevations to hunt deer because it is cooler in the higher, thinner air. Also, deer will normally only be active early in the mornings and evenings. This means hunters will only have small windows of hunting opportunities. In 1995, it was one of the hottest and driest summers on record for southern Oregon and northern California. It was so hot, hunting success rates set new record lows as less animals were harvested that year than at any other modern time. Most people also thought that such heat had wiped out the deer population and so did I. However, 1996 presented a cooler and wetter year and the deer numbers were just fine. Where were they during all of the 1995 season? They were obviously hiding out in cool places. Go for the ‘deep shade.’ Deep shade doesn’t exist everywhere, but if your hunting location offers a core deer sanctuary that contains heavy foliage and is extremely shaded, that area could be considered ‘deep shade.’ These are the coolest and most moist spaces where deer thrive during hot weather. Stillhunting is one of the most useful tools of hot weather hunting if you do find some deep shade. The deer will most certainly be there, so if you can creep through the area, you have a good chance of making something happen. Finally, noise is the biggest hunting buzzkill and hot weather provides plenty of noise for hunters who wish to remain silent. Try to get some of the many hunting products that are made to help you walk quieter. I wear a homemade pair of boot muffs that are padded and have a skirt of fleece around the edges to muffle any crunching sounds my heavy feet might make. Some hunters will even take off their boots and make their final stalks in their stocking feet. Whatever works, works. Hot weather can be productive if you know how to overcome and adapt.